I mentioned on Facebook that my wife was buying a 4 wheeler. I just want to mention that we had an awesome weekend after we picked it up! She bought a Honda TRX420FE, which is a Rancher ES. It is a utility type of ATV, but it can still get out there and go. When we got down to her parents house, they took theirs and hers and went to town. She has some cousins in town and they have 4 of them (ATVs). So there was plenty to go around and not many people had to sit on the back of a 4 wheeler. They took us down to a trail that is in a wooded area where there are plenty of turns and ups and downs (and some big ups and downs) to get you quite a bit of advanced driving practice. Most of the time while we were in there, we would be in first or second. A few times there was a necessity to kick it into four wheel drive. I do have to say that it is the most fun weekend I have had since playing paintball in the woods! One of the most interesting things is how well it fits in the wife's truck. Another interesting story for another time, she owns a truck and I own a car (but I really have a truck too because she does)! This ATV fits very snugly into the bed of the truck and the ramps fit nicely right under it. It is almost like the bed of the truck was made to put this Honda in it. 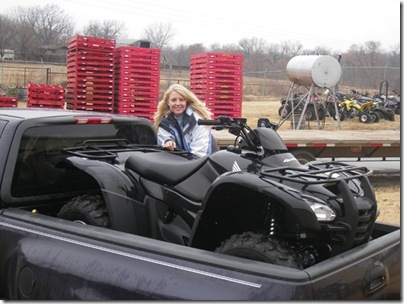 We had thought about the 500 model, but it wouldn't have fit in her truck, or most trucks for that matter. It is a bit wider and just a tad longer I believe. One thing, when your wife buys a brand new toy that is meant for abuse, make sure you are NOT the first one to take it out and abuse it. You may be the owner by marriage, but you are NOT the owner. I made this mistake when I took it out to the pasture and into a dense wooded area with evergreen trees. This meant having brush touch the vehicle and left scratches on the sides of the vehicle near the wheels. I should have waited for her to put some more scratches on it first! What do you say to that though? Now we have it at home and taking up space waiting for the next time we can take it out. I think that will be sometime over Christmas break. I have a friend out in Wichita that is ready to go riding. I have to get the wife's permission first... <g> ...and I promise to not put many scratches on it. So I read this post and thought you weren't that big of a geek... but then I skimmed down the rest of the page. Wow. Nerd!